ABOARD THE DESTROYER ROSS — Crewmembers are getting ready to head across the ocean for a homeport shift to Rota, Spain, and everyone has something they want to bring with them. The ship left Norfolk on Tuesday but before they did, sailors found nooks and fan rooms to stow personal items to bring to the Old World with them. 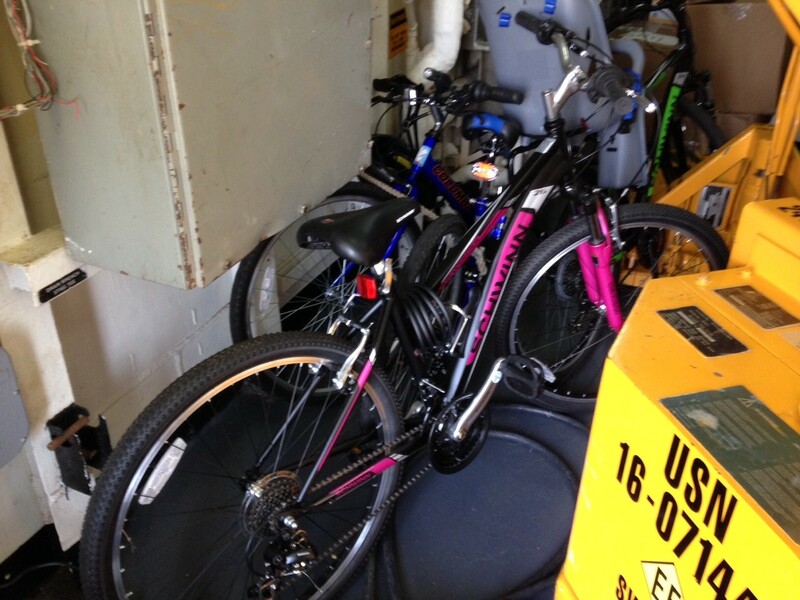 Most of the ship’s tight spaces seem to be taken up by bikes. Word has is it that both the executive officer and the commanding officer stashed bikes on board. A couple of the officers were trying to rearrange tiny staterooms to accommodate guitars and amps. The sailors have been busy loading stores and ammo but most are excited about the move. Those who didn’t want to move have largely transferred off the ship over the last year and a half. The ship’s schedule has been jam-packed since the end of 2013 and it’s been hard for some to find housing in time to move their families and make all the arrangements that comes along with moving out of the country. But when you ask them about Spain, most agree: they’re stoked. The ship recently returned from Operation Joint Warrior in 6th Fleet, a joint operation with the Royal Navy, and they had a five-day stop-over in Rota to scope out their new home. Most are eager to finally make the move. On the way over, they’ll be breaking in their new fire-retardant coveralls they were issued Wednesday. For more on the Ross’ move, pick up a Navy Times issue next week.